One of the many pleasures of driving through the Texas landscape is the opportunity to visit one of the 600 Dairy Queens that exist in the state. Although this fast food chain was born in Illinois, few things are more this quintessentially Texan. Wether you find yourself in Marfa, Midlothian or Mason, chances are you will find a Dairy Queen and chances are you will be compelled to buy yourself a a Blizzard. Speaking of which, my standard M.O. is to pull into a local DQ, place an order for a mimi "Chocko-Cherry Love" Blizzard and then make use of the facilities while that is being prepared. I'll then wash my hands, retrieve my soft-serve treat, jump back into my car and continue on my journey. It is during the critical third part of this process that I have a moment to relax and take note of the incredibly small size of most Dairy Queen restrooms. Building codes and regulations are good things. They make sure that our buildings don't collapse around us and that we can get out of them should they catch fire. The 1990 American With Disabilities Act (ADA) helped ensure that individuals with mobility impairments can use buildings as well as anybody else. That's why most restrooms you walk into are of a consistent, relatively large size. We are so accustomed to this size of restroom facilities that it feels odd to walk into one that is smaller. 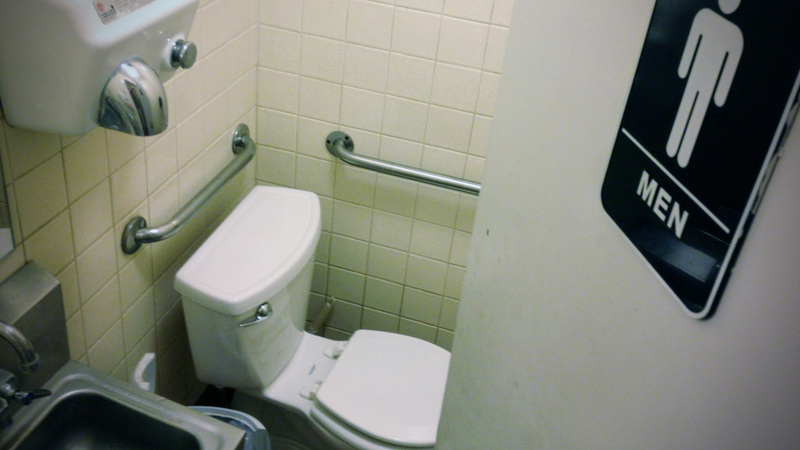 When we come upon a restroom of an unusually small size it typically means that we are making use of a facility that was built before the ADA became law. My guess is that Dairy Queens - especially ones in smaller towns - do not update their buildings as often as other franchises and so have not been required to update their restroom facilities. One side effect of the ADA and other building standards is that it makes our buildings feel - well - very standard. I'm not at all advocating that we should go back to the day when people in wheelchairs couldn't make use of public restrooms (notice that in the above photo that there is physically no way a person in a wheelchair could enter the 4' by 4' men's room and close the door behind him), but it does make it difficult to create exceptional spaces. But just because something is difficult doesn't mean that it is impossible. That's why there are architects and that's why you should pay them lots of money to create exceptional bathrooms that can be used and enjoyed by all.